Even after all these years I get so nervous on my first day. Today was my first day with the Pre-K. I arrived at school about an hour and a half before the children arrived so I would be ready. Even though I already had everything totally planned out, I still wasn't sure. It was actually a very good day. My Pre-K class is made up of mostly new children. The AM class has many children from last year's three-year-old class, but the PM class is mostly new children. They did very, very well. I was very impressed. 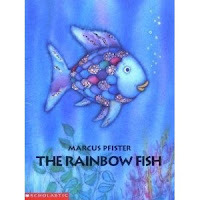 Today we read "Rainbow Fish," by Marcus Pfister. We focused on being a good friend, what it means to be a good friend and how you feel when you have a friend. We talked about Rainbow Fish's different feelings throughout the story, and the feelings of the other fish when Rainbow Fish was mean to them. They were very interested and had lots of good ideas. Our skill today was color review. I had done this last year with my Pre-K. I had a paper separated into three columns and labeled them with a crayon--today we did red, orange, and yellow. Then I had trays of paper rectangles. The children glued two the correct colored rectangles in each column. We ended the day playing a color game. I had a bag full of crayons. The children would pull out a crayon, tell us the color, then find something in the room of that color. They wanted to keep playing, but they also wanted to go outside--going outside won. Tomorrow is the first day of our three-year-old class, I hope they are as excited as the Pre-K children were.